Has it really been nearly a year and a half since I last wrote a post on this blog? It has indeed, and what an eventful seventeen months those have been! We moved into a new apartment last summer, and our new place is so much nicer. I think I might have mentioned before on this blog that my cat, Rose, and I are 100% solar powered. I don’t drink coffee, and I rarely drink tea, so I run on sunlight alone. Fortunately for Rosie and me, our new apartment is flooded with the most glorious light you can imagine from dawn to dusk. As luck would have it, we found a rare corner unit on an even rarer south face. We have eight large windows that face southeast and southwest. And if that wasn’t enough good fortune, we also have fabulous views of Pike’s Peak from our balcony and our dining room, which is where I do the bulk of my writing these days. Suffice it to say that Rose and I are supremely happy with our new surroundings. Rose’s days now consist of a well-established routine of following the light around the apartment and napping in the sun. Meanwhile, my days have been filled with the thrills and challenges of building a brand new blog. As I mentioned in my last post, Door 44 Jewelry is dead, but sort of like a Phoenix, Door 44 Studios was born of those ashes. Single-handedly running the small manufacturing company that Door 44 Jewelry was rapidly growing into proved to be wildly incompatible with the demands of my personal life. 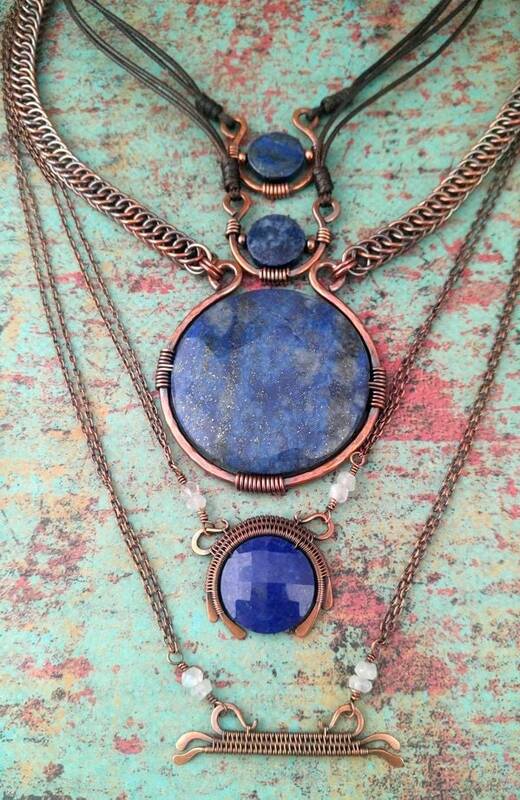 But I still love making jewelry, and I’m still compelled to be creative. So I’ve taken an entirely different approach to the jewelry business: I’ve switched from full-time jewelry maker to full-time jewelry blogger. What does that mean, exactly? Well, I still love to design and create jewelry, and I still want to do something productive with my time. So, I’ve made the transition from maker to teacher. Door 44 Studios is, as I like to think of it, the first step in the path toward wire weaving mastery. There I will be sharing free wire weaving patterns and tutorials for all of my original Door 44 Jewelry designs along with all the lessons I learned while running my own jewelry business. Jewelry makers are notoriously secretive about their processes, which makes it unnecessarily difficult for those who are interested in the craft to break into the field. Well, I’ve decided to change that. So far I’ve shared some useful tips and tricks for product photography and tumbler maintenance. 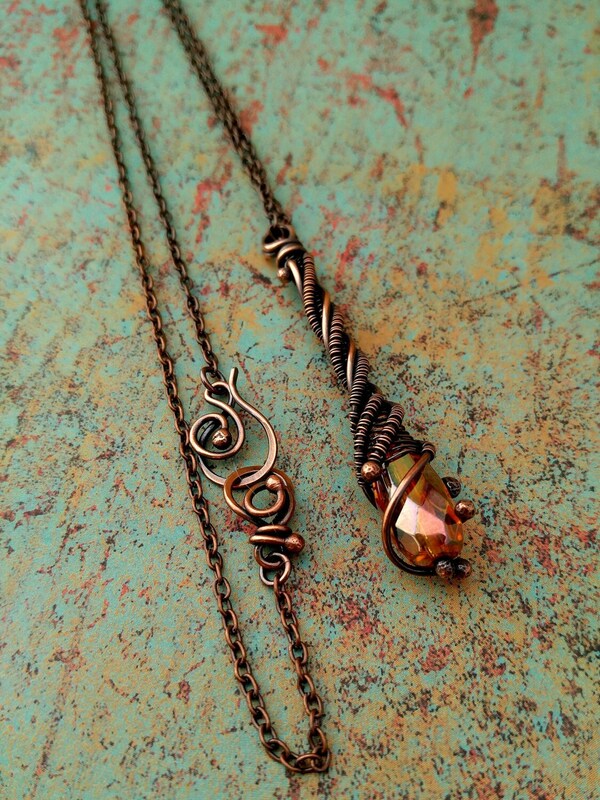 I’ve shared three free wire jewelry tutorials, I’ve pulled back the curtain to reveal my favorite jewelry supply resources, and I’ve reviewed the most recently published wire weaving book. And there is so much more to come! Seriously. My editorial calendar is booked into August so far, and I come up new ideas for blog posts and tutorials every day. Maybe it’s the light in our new apartment, or maybe it’s that spectacular view of Pike’s Peak, but I haven’t felt this inspired in years! I’m not sure yet what will happen to this blog. It might become the place where I share more personal musings, or I might decide to shutter it completely. I’ll leave it up for the time being while I figure that puzzle out, but this is the last post that I’ll be publishing here for the foreseeable future. If you’re interested in learning to weave wire, or if you’re a jewelry maker running a small business, I invite you to follow me at Door 44 Studios. Be sure to sign up for my newsletter so you’ll be among the first to know when I release my latest jewelry tutorials or jewelry business-related blog posts! I’ve also reopened my Etsy shop where you’ll find printable PDF versions of my tutorials and even a few new jewelry pieces now and then. Although making finished jewelry is no longer my primary focus, I will occasionally list pieces for sale — particularly for some of the new designs I have coming up on my editorial calendar. Finally, thank you so much for joining me on the journey that was Door 44 Jewelry and Beyond Door 44 over the past few years! I sincerely hope that you’ll hop on over to Door 44 Studios so we can continue our journey together. I can think of no better travel companion than you, dear reader. I’ve always been fascinated with arrowheads. I grew up on the high plains of southern Colorado, and as a child I spent countless hours exploring those plains on horseback. Occasionally, I was lucky enough to find a genuine arrowhead–a tiny relic of a forgotten time when those same plains, now subdivided by barbed wire, were dominated by herds of bison that roamed freely and the Native American tribes that depended upon the bison for subsistence. Genuine arrowheads are very difficult to find these days, but they continue to have a certain mystique in the American West. I’m clearly not the only one who finds them fascinating because modern replica arrowheads can now be found in pretty much every rock shop in the west. That’s precisely where I found the Fancy Jasper arrowhead I chose for this necklace–in a charming little rock shop in Virginia City, NV. I never know exactly what I’m going to do with some of the pieces I pick up while I’m traveling, but I’ve learned to pay attention to what is now a familiar sort of magnetic pull of certain stones. I can’t help but pick them up, and those are the pieces that I’ll buy. Even when I can’t possibly imagine what I’ll do with it in that moment, I’ve learned that inspiration will inevitably flow. The seemingly random stone that I picked up along the way will eventually let me know what it wants to say. And so it is with this piece, which I’ve named Eye of the Hunter. Turn on your TV or open an Internet browser these days, and you will almost certainly be convinced that the world is descending into complete chaos. Our country is more deeply divided politically than perhaps at any time in American history. Millions of Americans are marching and chanting and demanding rights they already possess while millions more trudge off to work every day, quietly hoping that they can manage to keep food on the table and a roof over their heads for another day or week or month. Those people dare not look further than a month into the future because they’ve learned over the past decade that the rug can be pulled out from under them at any moment. Given the instability constantly portrayed on the news, it’s easy to believe that things are only going to get worse for us. But if you step outside and look around, you’re likely to find that everything is exactly as it should be. The balance and order we’re all desperately seeking is as close as our neighborhood park or greenbelt. Growing up in a rural community, I was fortunate to spend the vast majority of my childhood outdoors. I had unfettered access to 20,000 acres of pristine land, which I explored on horseback as often as I possibly could. The countless hours I spent roaming that land, listening to the distinctive sounds of the high plains prairie and surveying wide open spaces as far as my eyes could see, left me with a deep and indelible connection to the natural world. Whenever things start to feel out of balance in my life, I look to reconnect with nature. And the moment I step onto unpaved ground, I’m reminded again that the connection was never broken. I just believed I had lost it because I was focusing on the chaos instead of the order. There is a natural order to our world, and no matter how much man claims to be above that order or in control of it, the truth is that we’re as much a piece of it as any rock, tree, or animal. We are intrinsically bound to this planet in much the same way that we are bound to our parents and our children. The Native American Indians who once hunted these lands upon which my family now lives in a second floor apartment on the western edge of a sprawling Colorado town understood that basic truth. They knew that they were as much a part of their world as the bison that sustained them and the stones from which they honed their weapons. That understanding was central to their very survival, so they never lost sight of the common bond between themselves and the bison. Their focus was always on order rather than chaos. Today, in a world where our food comes neatly packaged in tidy little boxes and we spend more time staring at screens than gazing out of windows, we’ve lost that focus. We’re so easily distracted by the chaos we see on the Internet and TV, and it’s easy to believe that the chaotic world portrayed on the screens that we’re so addicted to is the real world; but it’s not. The world in which we live is as ordered as it ever was. All we need to do is turn our focus to that order. Eye of the Hunter is a reminder to turn our focus away from the chaos of politics and back to nature because it is there that we will find our way back to peace and order. What we focus on is what we foster. If you want peace, focus on peaceful things. If you want abundance, focus on those areas where your life is brimming with abundance. We all have some form of abundance in our lives for which we can be grateful. If it’s joy that you seek, focus on the squirrels chasing each other around the tree in your front yard or on the birdsong that wakes you at dawn. Animals–particularly small woodland creatures–are inherently joyful. It’s no accident that nearly every Disney film includes scenes of a pretty girl singing joyously while surrounded by helpful woodland creatures joining in her song. Nature calls upon us to acknowledge our connection to it. I feel that call daily. Do you? Do you answer it? All forms of Jasper are considered to be nurturing stones, and we’re all in need of more nurturing these days. It is my hope that this necklace will help at least one lovely woman reconnect with nature so she can restore the balance of strength and softness that is inherent to all women. The world needs more balanced feminine energy, and I can think of no better way to restore that balance than to bring as many women as I can possibly touch back to nature. 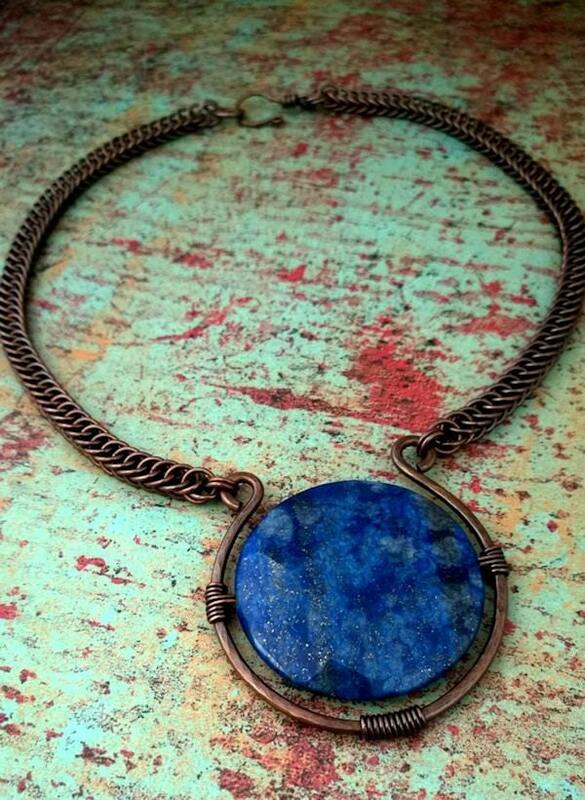 Eye of the Hunter consists of a Fancy Jasper replica arrowhead that has been intricately wrapped in handwoven copper wire and embellished with a Red Creek Jasper “eye”. The back of the pendant is finished in a pretty filigree of scrolls, so this piece can also be worn reversed. The pendant, which measures about 3 inches long by 1-1/4 inches wide, is strung on five strands of waxed nylon jewelry cord. Each cord is hand knotted with an array of natural copper and colorful Red Creek Jasper beads. 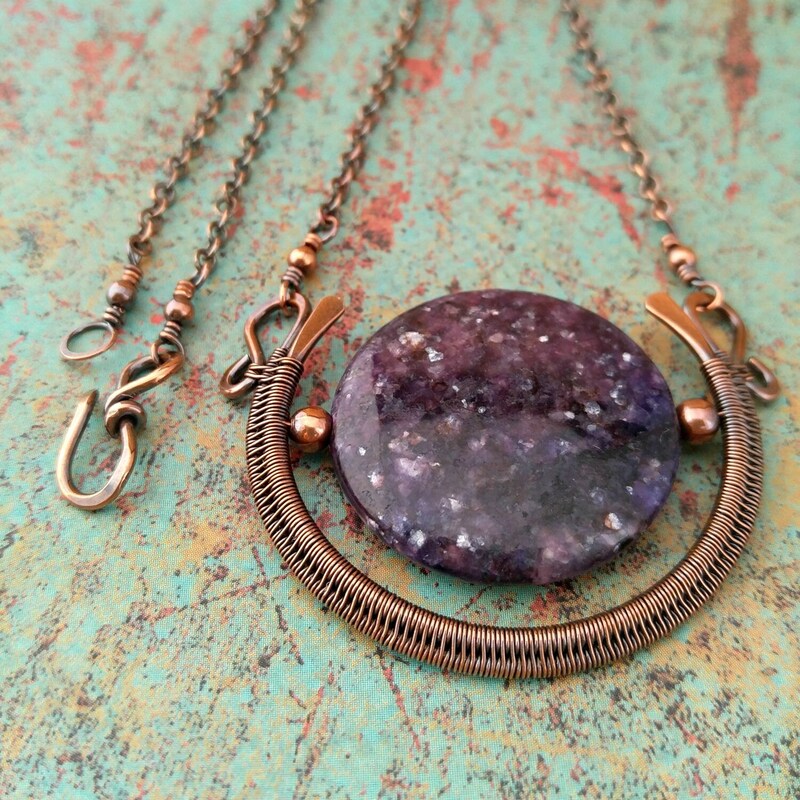 Finished with an adjustable slide knot, this one-of-a-kind necklace can be adjusted from 24-40 inches long. It is currently available for sale exclusively at door44jewelry.com. When it comes to jewelry, there are two kinds of people. There are those who see jewelry strictly as fashion accessories, and then there are those who see jewelry as deeply personal pieces of personal expression. I find that most of my customers tend to fall into the latter group, which is extremely fortunate for me because I learn so much from their stories and from working with them to create something that is uniquely their own. Every now and then, I get a custom request that reminds me that I am ultimately in the business of helping people, and “Fly With Me” began with one such request. On December 3rd, I received an inquiry for a custom piece from a guy who is clearly head-over-heels in love with his girlfriend. He explained that his girlfriend lost her horse suddenly eight months ago, and she’s been grieving ever since. I’ve had a life-long love affair with horses myself, and I’ve had some mystical experiences with them through the years. So, I completely understand the depth of the bonds that form between horses and the women who love them. The story broke my heart, but at first I declined the request because I’m unfamiliar with horsehair as an art medium. I referred the customer to a company that specializes in horse hair jewelry, but sadly, the lock of hair his girlfriend managed to keep from her horse was too short for that company to use. They’d already been turned away from there. At that point, I realized that I needed to take this commission, if for no other reason than to give a grieving young woman some peace. Once I agreed to the commission, the design came together almost effortlessly. “Fly With Me” is one of those rare pieces that allowed me to get into that elusive flow that every artist lives for. Anyone who has ever galloped freely across an open field on the back of a beloved horse knows very well the sensation of flying just above the ground, and the horses we’ve loved and lost remain forever in our hearts. They’re angels with hooves. Wings seemed like the perfect theme for this piece, and I love the way the wings turned out. They’re subtle, and they frame the focal piece—a tassel, which is made with a lock of a beloved horse’s mane—perfectly. Since this is the first time I’ve ever worked with horsehair, making the tassel was a bit nerve-wracking. The client provided precious little hair, so there was absolutely no room for error. Once I finally worked up the courage to give it a go, however, even that part of the process flowed effortlessly. “Fly With Me” is just one of those pieces that was meant to be, and I’m so grateful to have been a part of it! “Fly With Me” consists of .999 fine silver wings which frame a horsehair tassel capped in silver plated pewter and sterling silver wire. The pendant, which is approximately two inches wide by three inches long, is suspended from a patterned sterling silver chain. The chain is accented with pretty little gray and aqua blue Amazonite beads and finished with a hand forged sterling silver clasp. Amazonite is a healing stone that is believed to help soothe emotional trauma, and I can think of few things more emotionally traumatic than suddenly losing a beloved horse. They’re such powerful creatures, yet their lives are startlingly fragile. That, of course, makes them all the more precious to those of us who know and love them. If you’d like a special horse remembrance necklace of your own, please email your request. I plan to make this design, along with one or two other concepts currently in the works, available in my shop in 2017 as made-to-order semi-custom designs. November is, for many of us I think, a time to be thankful. As I’ve grown older, I’ve found that I naturally tend to retreat inward around the winter holidays. I don’t retreat from the outside world so much because I want to escape, but more because I feel a strong internal pull toward introspection. This is the time of year that I tend to take stock of my life. I review the previous ten months and consider whether I am pleased with the direction I am going, or if perhaps I need to adjust my course a bit. Or maybe a lot, as has often been the case in previous years. This year as November rolled around and I felt that familiar pull to examine my life, I was pleased to discover that all is right in my world. It’s a wonderful thing to internally examine your life and find that everything is exactly as it should be. Don’t get me wrong. I’m not saying that my life is perfect. It’s far from perfection, as a matter of fact. It’s just that I feel for once that I am right where I need to be and that no major course corrections are necessary to get me back on the right track. As I’m sure you can imagine, Door 44 Jewelry is a very big part of my life. Launching a business and taking the leap into self-employment is daunting, to say the least, but this has been an amazing year. So much so, that I wanted to express my gratitude to the many people—friends, family, fans, and customers—who helped make 2016 such a remarkable first year for me. I am so grateful for the support of every person who has contributed to what has been a very successful first year in business, and there have been a lot of people involved. I’ve sold over 100 pieces of jewelry to customers all over the US, and just today I shipped my first international order. One of my wildly popular Trumpet Vine pendants, pictured below, is on its way to France as I type. I realize that I can’t do what I do without the customers who buy what I create, so I decided to give away six pieces of jewelry over a period of six weeks to show my customers how much I appreciate them. I’ve already shipped five of those pieces—the fifth one, a gorgeous Lepidolite Egyptian Moon pendant pictured below, went out today along with the order I shipped to France. So, I only have one piece left to gift to a member of the Door 44 community. I’ll be giving a limited-edition silver and blue Winter Icicle pendant to one lucky winner on Saturday, December 17th. If you’d like to have your name thrown in the hat from which my husband will blindly pull one name next Saturday, just ‘like’ and share this Facebook post. Follow Door 44 Jewelry while you’re there for exclusive savings and the latest news about what’s happening on my workbench. And if I haven’t already said it to you before, welcome to Door 44 Jewelry and thank you for shopping. Please come back again! …the Internet trolls start hating on you. It’s one of those things you always half expect to happen as a working artist (or just as a healthy, functioning human being who interacts with the outside world, I suppose), but it’s no less shocking or upsetting when it finally does happen. Initially, I intended to show my sweet little troll’s user name to properly call her out as the shameful coward that she is, but a quick Bing search suggested that, although it’s likely this handle is used by one individual all over social media, it’s equally possible that there is more than one person going by that name. I don’t want to inadvertently disparage someone by that same name who does not run around the Internet verbally attacking people behind the guise of a nameless, faceless Etsy user profile. So, I’ll just refer to this individual as My Pet Troll or MPT from now on. I replied immediately to MPT and invited her (I presume she’s female, based on her user name) to a very open and honest discussion about which pieces in my shop she feels are stolen. Needless to say, the response to my invitation has been deafening silence thus far. I’ll let you know if she does accept my invitation to hash things out. Here’s the thing: an unfortunate reality of being a working artist and throwing your work out there for all the world to see is that people are going to knock off your designs. That’s just the nature of art as a business. If I had a dime for every one of my designs that I’ve seen pinned to someone’s “Projects to Try” board on Pinterest, I’d make way more money than I’ve made from sales of those same designs through my Etsy shop. The numbers aren’t even in the same ballpark, as a matter of fact. One of my most popular items on Pinterest, my Trumpet Vine Earrings (pictured below), has been pinned nearly 1000 times through multiple image sources to inspiration boards all over Pinterest. I’ve yet to sell the first pair of those earrings, which is a shame because they are truly lovely. Photos simply don’t do them justice, but I digress. Am I under any illusion that people aren’t already knocking off this lovely earring design? Nope! Do I care? Honestly… a little, but not as much as you might think. For one thing, I know perfectly well that I’ve drawn inspiration from other wireworkers while honing my own wire work skills over the past several years. I still draw inspiration from other artists, to some degree, though the field of artists who inspire me narrows as quickly as my own design skills and confidence improve. I don’t believe I’ve ever overtly stolen another artist’s designs, but I’d be lying if I said I never got ideas from other people’s work. I don’t live in a bubble. I see all the same things on Pinterest as everyone else who shares my interest in wire jewelry, and with a nearly photographic memory for things that catch my eye, it’s virtually impossible to erase anything I’ve ever seen from my mind. One of the ways I strive to stay true to my own creativity is that I don’t keep any visual references within eyesight while I work. My laptop is not even in the same room while I am designing, and I have to get out of my chair and walk clear across the room to reach my bookshelves if I need to refer to a book or magazine article for technical reference. 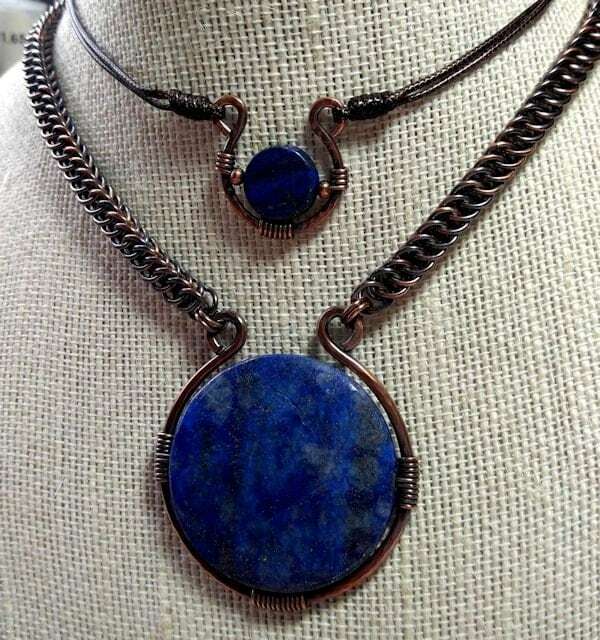 The only time I keep a visual reference in front of me is if I am consciously recreating a project from a purchased tutorial or book, and as of last year, I’ve stopped purchasing books or tutorials for wire wrapped jewelry, which is my primary discipline. I reserve browsing Pinterest, Instagram, and Facebook for times when I am away from my workbench and out of work mode, and then I consciously stay off the Internet and away from photographic images of jewelry when I sit down to work. I’ve also been signing up for a few classes in other jewelry making disciplines, such as bead embroidery and micro macramé, for two reasons: First I feel it’s important to give myself a mental and physical break from wire wrapping now and then. Secondly, I’m interested in further setting my work apart from other wire artists by integrating other techniques and disciplines that interest me. My system for maintaining design integrity isn’t perfect. I don’t doubt that the work of certain artists I admire clearly influences my own work, and I openly address that fact in my product descriptions as well as in my Etsy profile. Short of properly crediting those artists when I do create something designed or inspired by them and continually policing the visuals available to me while I am in design mode, I don’t know what else I can do to ensure that my designs are purely and clearly my own. Several hours after reaching out to her, I’m still waiting for MPT to tell me which of my designs she believes have been stolen from another artist, but I won’t be surprised if I never hear from her again. Not directly, anyway. If she stays true to the tried and true Internet troll formula, she may very well start anonymously bashing my work on every social media platform where I have a presence. And my response will remain the same. I’ll invite her to engage with me in a civil discussion about my work so we can get to the bottom of this “creative theft” nonsense. Thankfully, I recently had a very different conversation with a happy repeat customer who sincerely admires my work. Had I not already been actively engaging in a discussion about the evolution of personal design style, my response to MPT might have been far less calm and rational, so I owe this wonderful customer a huge debt of gratitude for that as well as for her continued encouragement and support. According to this lovely lady, who makes no effort at all to hide her true identity in her own Etsy profile by the way, my work has a certain recognizable style that she feels she could identify even if not clearly credited to me. That, of course, is the highest compliment any artist can ever hope to receive. That unique individual style is what every working artist strives to achieve because no one with even a modicum of integrity wants to be accused of creative theft. Life is hard enough without hating on random strangers we encounter on the Internet, isn’t it? One of the things I told my lovely customer, who is also a jewelry maker, is that there’s more than enough room at the table for all of us because we all have something unique and special to offer the world. I hope to be the sort of artist who encourages up and coming artists to spread their wings and fly. I’m on the fence as to whether or not I’ll start offering any of my designs for sale as tutorials or start formally teaching classes. Part of the challenge of that for me is that I’m left handed, so writing tutorials and taking photos that will make sense to everyone may be tricky. That said, I trust that those who admire my work will treat my designs as respectfully as they’d like me to treat their own designs. If we all do that, we’ll all thrive. Believe it or not, there are enough potential customers and admirers out there for all of us. A message for MPT, on the offhand chance she’s reading this: There’s no reason to be so mean and spiteful. If you feel strongly that someone is stealing another artist’s work, it’s not unreasonable to confront her about it, but do it respectfully and don’t hide behind an anonymous user profile. Any artist who is worth her salt will welcome a respectful dialog about the origins of her designs, just as I have. Life is short, people–much too short for petty nonsense from nameless, faceless trolls. Do what you love, do it with integrity, and never let the haters bring you down. Something broke loose recently. I’m not sure what or how, but after months of being stuck in what felt like a mental logjam, I’m finally back in the flow. Back in a flow, that is. I have no idea where the current will take me, but I’m so relieved to finally be moving forward that I don’t think I care. On the jewelry front, I’ve been busy. As I mentioned in my last post, I’m working through Sarah Thompson’s new book, Fine Art Wire Weaving. 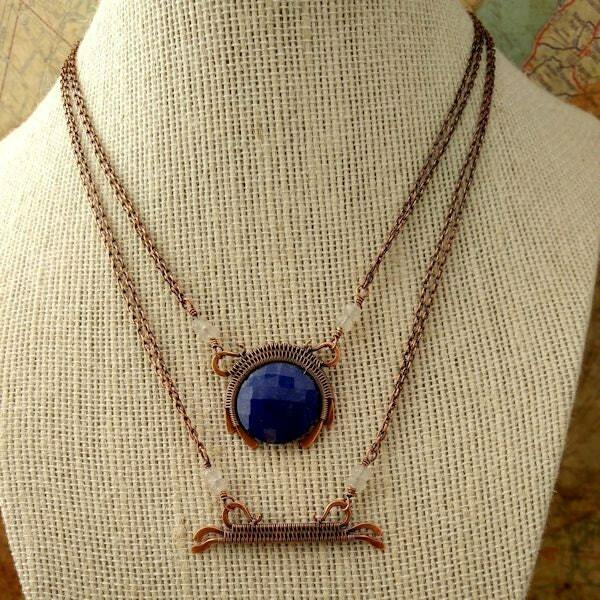 I’ve been making jewelry my whole life, and I’ve been focused on wire jewelry specifically for about five years now. I feel like I’ve explored just about every wire wrapping style and technique there is at this point, but the techniques I’m picking up from Sarah Thompson are proving to be the key to unlocking my own personal wire wrapping style. After years of creating jewelry that was almost, but not quite, what I’d envisioned, I’m finally starting to find my own creative “voice”. The three pieces featured in this post are Sarah Thompson’s designs–projects from her book. Sarah’s book has not only been instructive, but it’s been tremendously inspiring as well. Stay tuned for some of my own original designs, which I can create to my own satisfaction now that I’ve finally found the right weaves and construction techniques to translate my ideas into finished jewelry.